The January transfer window is expected to close on Portadown, Annagh United and Loughgall tonight at 11 o’clock with minimal deadline day drama. Additional signings are not expected across the three clubs - however, the Ports, United and the Villagers can look back on a busy few weeks since the New Year. “We are not expecting anything else to happen but I am certainly pleased with our work so far,” said Dean Smith, the Annagh boss. “We have Adam Neale on board to give us three strikers up top. “Adam was on the books at Linfield as a young lad and has a good scoring record in recent seaons with clubs like Dromore, Drumaness and Dundela. “He is young, only 21 or 22 years old, but can boast a decent amount of experience so we are happy to have him alongside Scott McCordick and Chris McElroy. “We have also signed two young defenders in Ross Wilson and Adam White from, respectively, Loughgall and Portadown. “Ross made his debut recently against Dergview and looked assured, especially for a 17-year-old. “Adam has had injury problems this season but got 60 minutes under his belt for our reserves. “Mark Whitten has also joined us from Portadown. “We have sent Jamie Smith on loan to Banbridge Town to try and build up his match experience. Loughgall have also signed Joseph O’Connor - a teenager previously with Leyton Orient - plus secured the return of Mark Carson on loan following his summer switch from Lakeview Park to Portadown. Portadown’s transfer window has been dominated by a deal to bring former Derry City and Linfield playmaker Philip Lowry to Shamrock Park on a short-term contract. The only other addition is young forward Mike Withers from Lisburn Distillery. 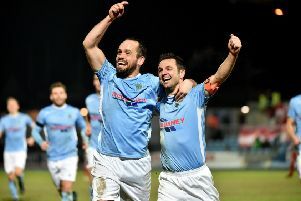 Darren Murray’s transfer to Cliftonville proved a major talking point - with Billy Brennan (Larne) and Shea Conaty (Lurgan Celtic) also departing from the Ports.